The Dearborn Community Fund invites YOU to explore an impressive glass gallery, see glass blowing demonstrations, and enjoy live music and hors d’oeuvres at its first-ever “Glitter, Glass, Giving” fundraiser at Dearborn’s fascinating gem, the Glass Academy, on Tuesday, Dec. 6, from 5 to 7 p.m.
General admission donation is only $5! * Cash bar featuring wine and locally crafted beer made by Dearborn Brewing. Please call 313-943-5478 or purchase ticket online at https://dearborncommunityfund.org/give-online/ — check the “DCF EVENT” box and select your donation below. Donations of $25 and above include additional benefits such as beverage tickets and the opportunity to win door prizes. More creative or inquisitive guests can make an additional donation to try their hand at glass blowing through a “Big Bubble Blow” experience or they can make a glass paperweight or flower to take home. * The DCF is a 501c3 charitable organization, so all donations are tax deductible to the full extent of the law. “We’re excited to invite guests to join us in the creative environment of the Glass Academy’s 14,000-square-foot studio. It’s the perfect venue to raise public awareness and support for the Dearborn Community Fund which focuses on supporting innovative projects that add to the vibrancy of our city,” noted DCF Executive Director EmmaJean Woodyard. The Gallery will be brimming with beautiful hand-carafted items, perfect for home decorating or holiday gifts. In addition to hand blown glass ornaments and signature glass icicles, handcrafted custom works such as paperweights, beer mugs, and signature piece Detroit Puddle, created by pouring hot glass over a sewer cap, will be available for purchase. 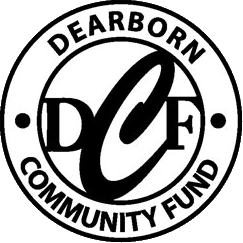 To learn about the nonprofit Dearborn Community Fund projects that will be supported by funds raised at “Glitter, Glass, Giving,” visit www.DearbornCommunityFund.org. For more information about the “Glitter, Glass, Giving” event, call 313-943-5478. *The DCF is a 501c3 nonprofit organization, so portion of all donations are tax deductible.